As the cooler weather begins to move in (ok, maybe not quite yet, but soon enough in my eyes), I begin to think of comfort food/meals that we will be preparing in our kitchen. We have already frozen enough chili and vegetable soup made fresh from the ingredients of our summer garden, to last us until next spring, but there is just something about a hot bowl of creamy tomato soup served with grilled cheese that makes even my heart warm. Now most of us are used to opening a can of tomato soup and adding a can full of cream, milk or water to the pan. We heat it, and wait until we can dunk the tip of the sandwich in it without burning our mouths. Yes, that is how we both grew up — and I would have to say, it was delicious. 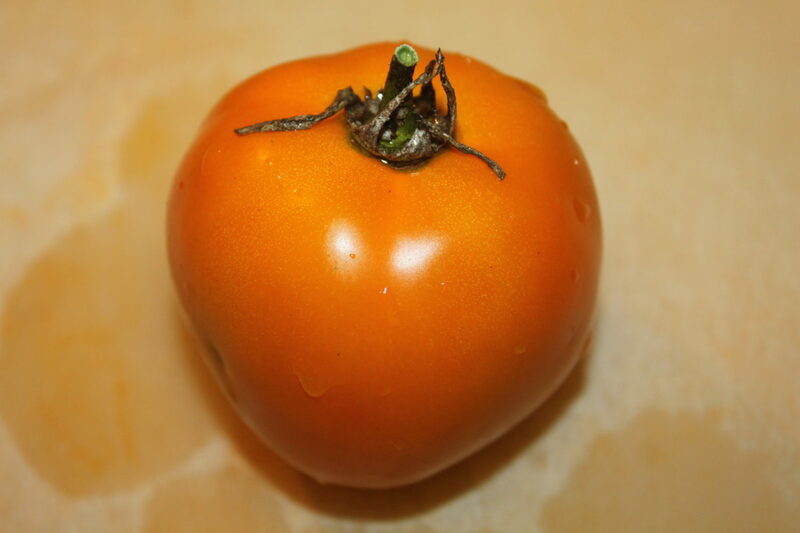 You can use almost any tomato to make soup, but we really like to use our low acid tomatoes that we don’t use for canning. But this all changed when we ‘grew up’ and came to the realization of what was actually in our soup. Honestly, didn’t you think tomato soup would be just that – tomatoes? Here is the ingredient list from a popular soup company for Condensed Tomato Soup: Tomato Puree (Water, Tomato Paste), High Fructose Corn Syrup, Wheat Flour, Water, Salt, Potassium Chloride, Flavoring, Citric Acid, Lower Sodium Natural Sea Salt, Ascorbic Acid (Vitamin C), Monopotassium Phosphate. After reading that, I much prefer to make my own tomato soup without all the unnecessary additives — and what exactly is ‘flavoring’? The good news is that making your own tomato soup is extremely easy and not as time consuming as you would think. 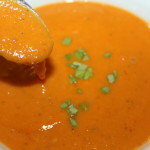 The most common question that we get is how do we make creamy tomato soup without adding milk. The secret is adding white bread to your recipe. And to make it vegan friendly, just make sure the bread is vegan — simple as that! 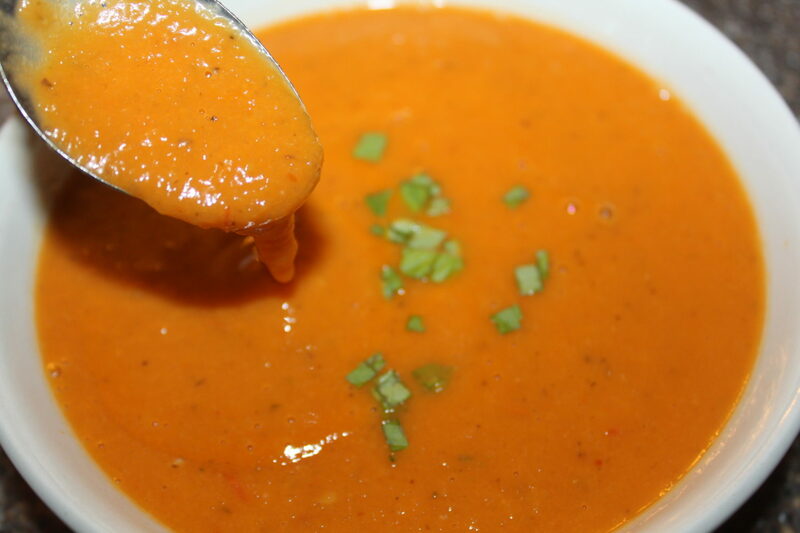 We actually double or triple the below recipe and freeze it so when it is time to have that bowl of creamy tomato soup and a grilled cheese sandwich it is just as easy as pulling a can off the shelf. 1. Heat 2 tablespoons olive oil in a large saucepan over medium high heat until hot. 2. Add garlic, onions, oregano, and red pepper flakes. Cook, stirring frequently until onions are softened (about 4 minutes). 3. Add bread and tomatoes. 4. Roughly mash tomatoes with a whisk or a potato masher. Add 2 cups water if more liquid is needed. Bring to a boil over high heat, reduce to a simmer and cook for 5 minutes. Add basil, parsley or chives for an added depth of flavor. Enjoy! 5. Transfer half of soup to a large blender (making sure to fill the blender no more than half full) Blend soup, starting at low speed and gradually increasing to high- opening the vent and holding a kitchen towel over the lid to prevent an explosion. With blender running on high, gradually trickle in half of remaining olive oil. Add salt and pepper to taste. 6. Transfer to a large bowl and repeat with remaining half of soup and olive oil. 7. Eat immediately or cool and freeze into desired portion sizes. Heat 2 tablespoons olive oil in a large saucepan over medium high heat until hot. Add garlic, onions, oregano, and red pepper flakes. Cook, stirring frequently until onions are softened (about 4 minutes). Roughly mash tomatoes with a whisk or a potato masher. Add 2 cups water if more liquid is needed. Bring to a boil over high heat, reduce to a simmer and cook for 5 minutes. Transfer half of soup to a large blender (making sure to fill the blender no more than half full) Blend soup, starting at low speed and gradually increasing to high- opening the vent and holding a kitchen towel over the lid to prevent an explosion. With blender running on high, gradually trickle in half of remaining olive oil. Add salt and pepper to taste. 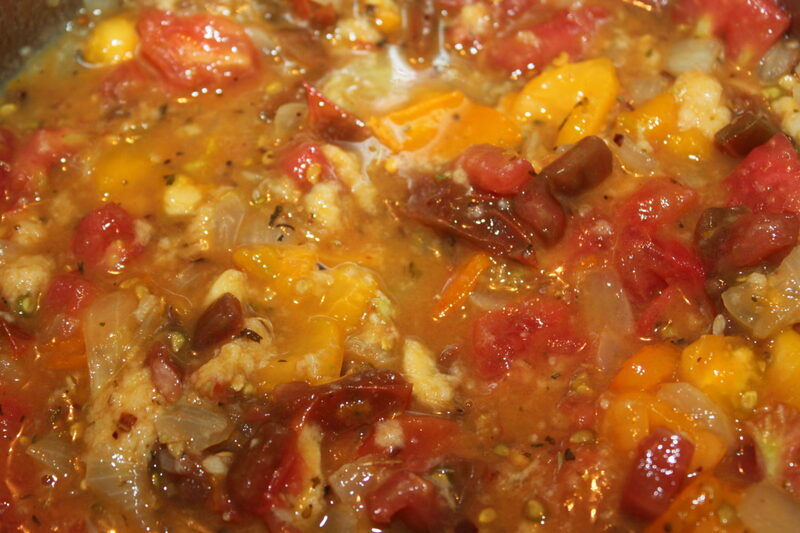 Transfer to a large bowl and repeat with remaining half of soup and olive oil. Eat immediately or cool and freeze into desired portion sizes. ← 4 “Must Do” Chores In Your Garden This Fall – For A Great Garden Next Year!